GY-HM620 MEGA 300 Rebate Offer --Everything you want! We think it's high time video professionals stop settling for anything less than everything they could want in their next camcorder. So, we developed the GY-HM620 and gave it a best in class wide-angle 23x Fujinon autofocus zoom lens, superior low-light and unmatched F12 sensitivity and the fastest shoot-to-edit workflow in the industry. 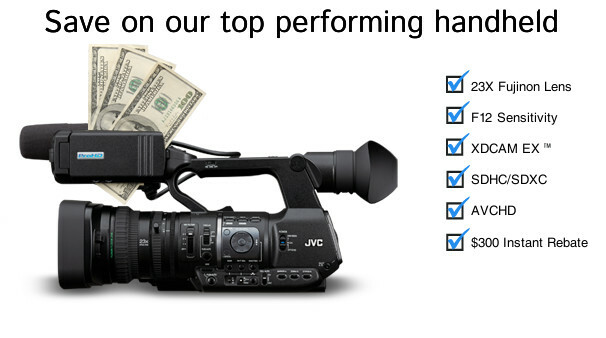 We also gave it a light-weight ergonomic design and the ability to simultaneously record to dual card slots in XDCAM EX™ (.MP4), Apple® Final Cut™ (.MOV), and AVCHD all to inexpensive SDHC or SDXC memory cards. Now with a special limited time $300 rebate good only now through September 30, 2019. Limitations apply. For complete terms and conditions click here.